My son (4) and daughter (3) have recently started talking a lot about trains. After our last trip to a local park we stopped by a small train station and decided to park the car and wait for a train to go by. The kids were sooooo excited. We waited and waited and FINALLY we heard the sound of the train’s whistle in the distance. It got louder and louder and then there it was, this big huge transportation machine. What a thrill for my children. Since then, they have been asking me everyday to watch this train video that we have. They have always loved Thomas the Train, but this video is actually about REAL trains. 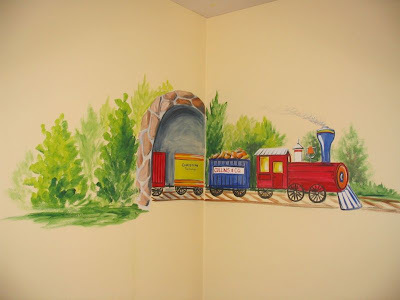 So, on that note, I have decided to gather up some Train Nursery Mural Pictures. This one is cute and can be done easily by any of you DIYers out there. I like how they incorporated the child’s name in the smoke. Love how they added the railroad crossing sign. Great touch! This one is my favorite. I love how it is not a full on mural. The artist used the greenery to narutally incorporate the scene into the beige base paint color. Doesn’t the red just POP? I also like this one because of the use of primary colors. Can you see the little deer peeking out from the bush? 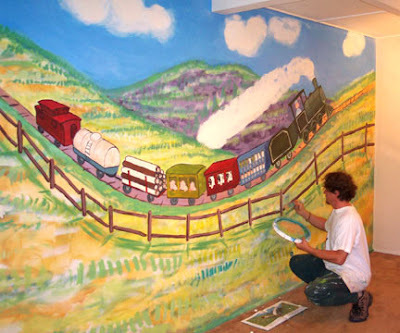 All of the above train murals are pretty simple. I’ll tell ya, boys never get sick of transporation vehicles such as trains, planes, trucks, motorcycles. 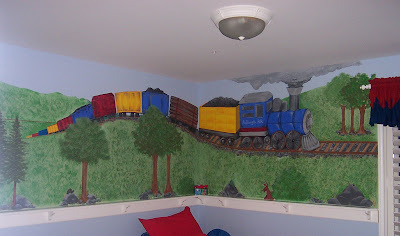 I think TRAINS is a great boy’s nursery mural theme to go with. What do you think?